As Myra Licht in BBC Two's Episodes, Haggard gurned her way through a series of frequently hilarious expressions, stealing every scene she was in. In Back To Life, the new BBC comedy-drama that she both wrote and stars in, her face is frequently in close-up. Often, Haggard doesn't need words to let you know exactly what her character is thinking. It's a quality her Back To Life co-star, Bafta-winning actor Adeel Akhtar, admires. Asked to name his favourite moment during filming, the Four Lions and Les Miserables actor immediately responds: "I really liked watching her (Haggard) do her stuff. There are moments where it's like, comedy, comedy, comedy and super funny and the comedy catches you in a way that you're surprised that you're gonna laugh. "And there's bits in there where she really moves you, there's bits where it's proper acting and I was massively surprised." Haggard interjects with a jokey question: "Because she's so c**p in everything else?! She's the one that does the face in Episodes!" Akhtar laughs: "Yeah! She had five different faces in one scene." In Back To Life, Haggard's facial expressions deftly switch between comedy and tragedy as the material requires. Haggard says public attitudes to women who commit crimes fascinate her: "I was always really interested in how harshly we judge a woman who has done a bad thing over how we judge men. "We put things that men do sometimes down to testosterone. We forgive them a little easier. "I wanted to write a show about a woman who had done something in her past and what that would be like, to try and start your life again with that enormous dark secret and baggage behind you." While developing the show, Haggard spoke to some former prisoners who had moved back into their family homes, just as Miri does: "I thought it was so fascinating because in some situations, you know, you have to register at the GP, you haven't got a note to say where you live, you haven't been on a date, you don't know how to interact. "You've had this extraordinary, massive, enormous experience but you haven't actually had some quite fundamental, day-to-day life experiences and I thought that was just a really interesting story." Haggard and her Perrier-award winning co-writer Laura Solon find a dark humour in Miri's struggles to pick up her life after 18 years. Though they are very different characters, Haggard's Miri has something in common with Phoebe Waller-Bridge's Fleabag, as both shows feature complex female leads, struggling to put their past behind them. Back To Life also attracted the producers of that award-winning show and will be shown in Fleabag's slot on BBC One from 15 April. She says: "Our voices are so different that I never wilfully felt I had to do anything to make it (Back To Life) feel different. "Phoebe is a genius and I love that show so much and I am so happy that she's doing what she's doing for women. "I think it's fantastic but also my voice is a different voice and so I didn't consciously do anything because it was just a very different story in my mind." As Miri attempts to rebuild her life, she forms a friendship with Akhtar's character, Billy. He says: "I play a character called Billy who lives next door to Miri and he's a gardener and they meet each other over a fence, and that's a detail which I think is important." Certainly, Miri spends much of the first episode trying to mend fences within her community, attempting to find a job and reconnect with her teenage sweetheart Dom (Game of Thrones' Jamie Michie). 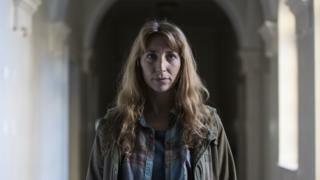 Despite the clues that leave viewers with an uneasy sense that Miri has, at one point, done something horrific, the writing and Haggard's nuanced performance mean you can't help but be on her side. Haggard says: "Miri is a relentless optimist. She's very determined. "She's determined to start her life and to try to have a life despite what's happened. In the end you're left judging the woman for who she is now, hopefully, and not for her actions in the past." Akhtar, who made Bafta TV history for being the first non-white best actor winner in the awards' 62-year history, says working on the show was a rewarding experience: "It was like no other job. I felt free to do whatever I wanted to do at the same time as being guided by this really amazing script. "You didn't want to go too far from what was written anyway, so it was just a perfect combination of so many things that I can't list for you right now. It was perfect, yeah."